Taylor Swift teams up with UPS to deliver upcoming album, "Reputation"
Taylor Swift's sixth album is set to be released Nov. 10. 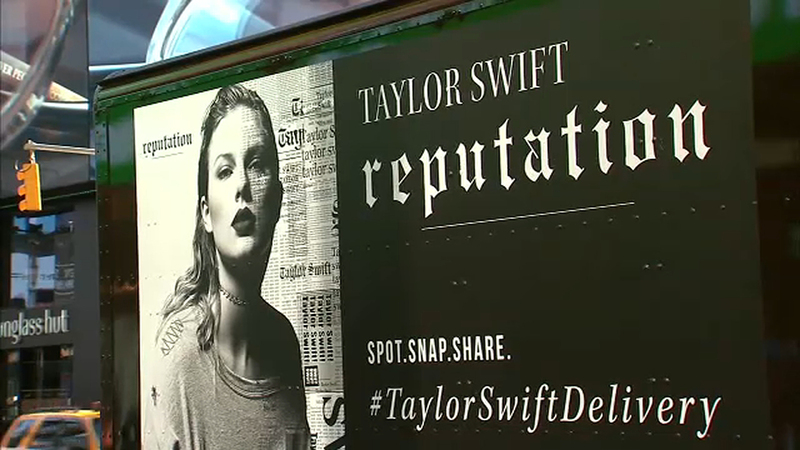 New York, NEW YORK (WABC) -- UPS is the official delivery company for Taylor Swift's upcoming sixth album, "Reputation." UPS tricked out some of its trucks with "tailor-made" decals to promote the album's highly-anticipated release. The decorated trucks are already driving around the streets of New York, Atlanta and Nashville, but more decked out delivery trucks will swiftly spread across the country. This is the first time in history that UPS has decorated its trucks for a promotional purpose. Although "Reputation" will not be released until Nov. 10, Swift's single from the album, "Look What You Made Me Do," came out Thursday, Aug. 24. Swift fans can post photos of the promotional trucks using the hashtag #TaylorSwiftDelivery and tag @UPS on social media for a chance to increase their likelihood of getting concert tickets.